I was at the pharmacy yesterday and I saw this gold / silver glitter nail polish. It was calling out my name, so just had to get it :) I think it's so pretty and girly but still edgy. I only applied it to one nail for now, but might do all my nails tonight with the weekend coming up and all :) Anyway I am in love with this combination! I think the grey really compliments the silver and gold glitter flecks. Essie "Sand Tropez" & Pop Beauty "Gold Glitz"
Pretty, but i should keep the glitter on one nail. It looks cute this way. Annie this is so pretty! I love your blog and your videos. Much love and keep doing what you're doing, cause you're amazing!! Took me awhile to comment cause the comment section wasn't loading properly. I hope I didn't spam you. Anyway,I really love that glitter polish! It reminds me of the glitter polish I purchased last Saturday by Jordana called "Purple Glam". I love it !!! 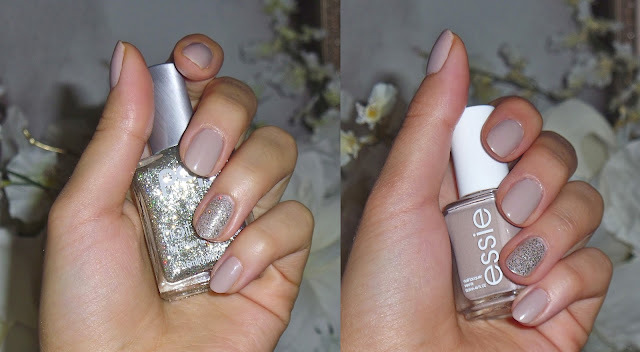 Essie's Nailpolishes are so gorgeous.. and you too !! !